I needed a large pair of mirrors to go over twin vanities. I never thought I would find them at the price I paid or the quality. Nice frame. Good craftsmanship. Hardware was included which is a nice touch. 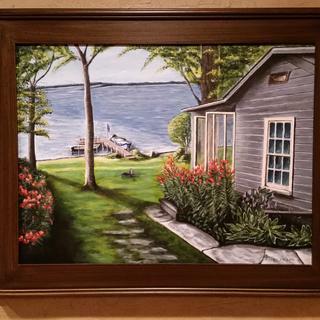 My customer loved the frame on the painting I made for her. Exactly what I wanted and soooooooo beautiful! Going to order more! Very pleased with my purchase. The frame is nice than I thought it would be. Excellent customer service I will recommend to friends and shop here again. Great alternative to bright gold. I used this frame for an autumn scene I did and the harvest gold coloring compliments my painting very well. I love that I have more then one option for a custom sized frame! 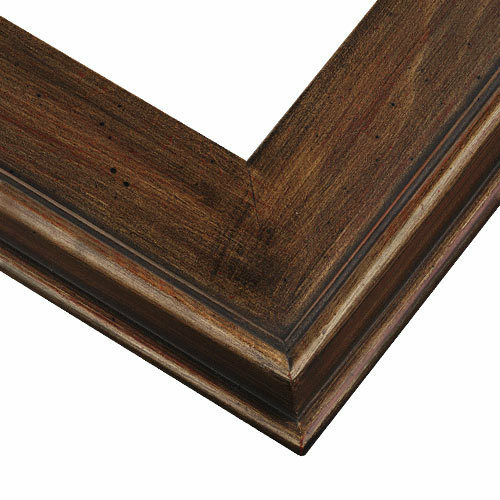 This frame is a solid, well made and suitable for Plein Air and oil paintings with a more casual feel or if you prefer not to have the more traditional frames in black and gold etc...The color "Harvest Gold" has very little sheen to it which makes it look more like a medium brown, thats hard to find in this great price range. I used this frame for a piece of leather craft I had done many years ago that had never been framed. It worked out beautifully and fits in the frame great! Love the quality and looks better than it did on line! Sometimes I am unable to determine how a painting will look in a particular frame so I buy several. This one is waiting for a future masterpieces. Haven't used it yet, but I'm sure I will! Looks very nice! Not like the picture. I bought this as a mistake I guess. Hi David. Thank you for your review. We regret to hear this frame did not meet your needs. We do have a 45 day return policy so that you can find a frame more suitable for you. Our customer care team is happy to assist you in setting this up. They are available Monday-Friday 8am-7pm eastern time and can be reached at 1-800-332-8884. Thank you for your business and have a great day! I have ordered frames from you before. You deliver high quality, accurate framing at a great price. There was brown in the painting so I choose this frame. Perfect for the photo I had to frame and rustic appearance. I'm looking for narrow frames for smaller paintings (8x10 & smaller) so I ordered the corner samples. I ordered the Harvest Gold frame because I already have one on a 9x12 oil painting and it looks great. I ordered an 11x14 this time for another oil painting that has a similar palette to the 9x12. My corner sample looks great - warm golden brown - so I'm getting a 9x12 because of the relatively narrower moulding. This should dress up one of my plein air landscapes. I have a leather art picture that I think this would look nice with. Attractive frame at a reasonable price. I felt this simple style would set off the red rocks of my Sedona landscape painting. I think it will look really nice with a botanical print from Jamaica. how wide is the frame 2" etc? Thank you for your inquiry. This frame is 3" wide. Happy Framing! for the 18x24 size, is the opening as seen from the front 18x24, or is the page size that gets inserted into the frame 18x24? How large is the opening as seen from the front of the frame? BEST ANSWER: Hello. The opening of the frame will be the artwork size with an 1/8" allowance. The final size will be 18.125"x24.125". Thank you for your inquiry! This frame looks brown to me. Is it actually brown with hints of gold? BEST ANSWER: Hello! This uniquely designed frame has a warm gold finish with crimson and red undertones. Please order samples to get a glimpse of the frame before making your purchase. Thank you for your inquiry! BEST ANSWER: Hello Linda! Thank you for your inquiry! This beautiful frame is made of Wood. Please let us know if you have any additional questions. Happy Framing! Thank you. Is it solid wood (pine?) or is it laminated? This frame is wood with a laminate overlay.